ABOARD THE QUEEN MARY 2 – We have only been on the QM2 a couple of days. Our first day was mostly spent exploring the ship and its many activities. Rain and cold weather kept most everyone inside so the atmosphere was subdued. Yesterday was a whole ‘nother story. 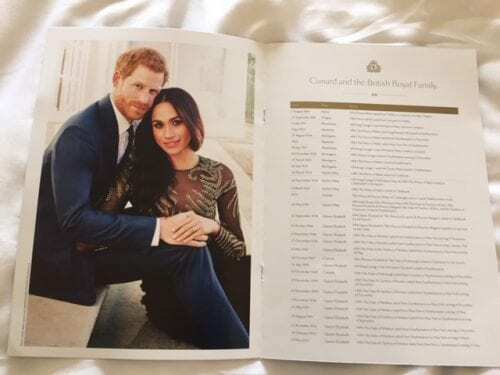 Much attention was paid to the Royal Wedding of Britain’s Prince Harry and American Meghan Markle which transpired early in the day. I turned on the telly to the BBC at 9 a.m. just in time to see the lovely couple walk up the steps to the altar. I was pretty much glued to the screen in my cabin for the next couple of hours. I guess all that I actually missed was Ms. Markle walking down the aisle, first by herself and then escorted by future father-in-law, Prince Charles. I know that particular detail because everyone was chatting about the wedding at lunch. 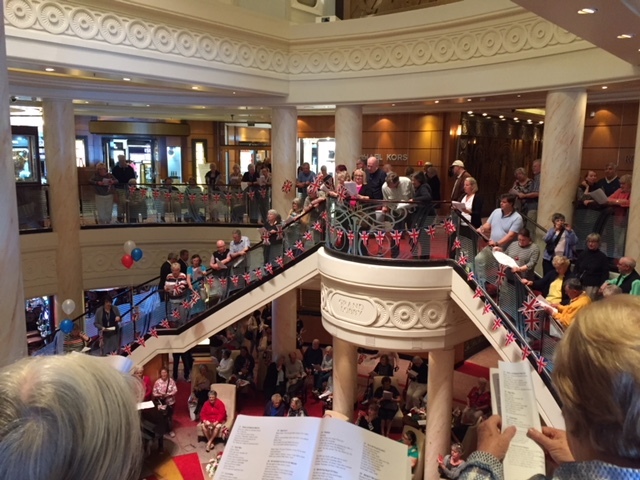 But before lunch, the ship launched the first of many festivities: A British Royal Regalia Sing-along. To further mark the occasion, Cunard shifted it second formal night (usually later in the cruise) to last night. 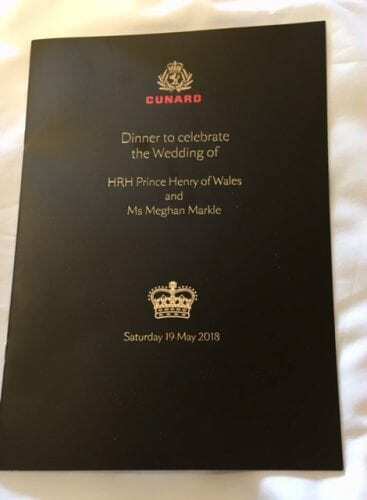 Everyone at dinner received with an impressive commemorative menu which detailed Cunard’s many royal connections and featured a full-page photo of the newly-weds. The entrees were special, too…including duck, lobster tail and beef wellington. 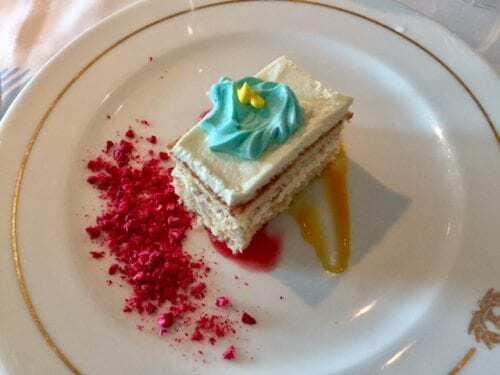 There was lemon cake for dessert, which was said to be similar to what was served at the wedding reception. Capping off the day was the Royal Cunard Ball held in the Queen’s Room which was decorated with reams of bunting. It was a happy, upbeat, thoroughly British day and everyone got in on the fun. Cunard really did itself proud.